Jean Pierre Vasarely “Yvaral” was born in Paris in 1934 and was the son of Victor Vasarely, the founder of “Op Art” movement. 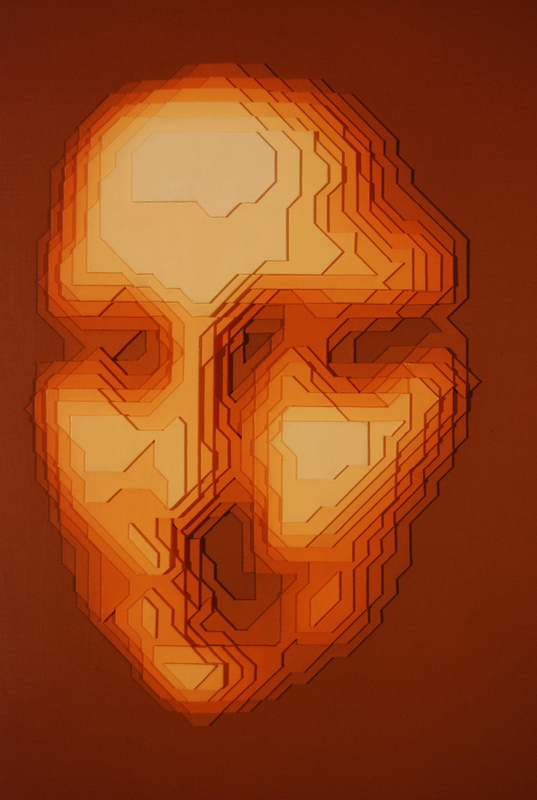 He is known for his work in Kinetic, Graphic and Optical Art. Yvaral attended the Ecole des Arts Appliques (School of Applied Art) in Paris. In 1960, along with Le Parc, Morellet and Sobrino, he co-founded Le Group de Recherche d’Art Visuel (The Group of Visual Art Research) with whom he exhibited throughout the world until 1968. 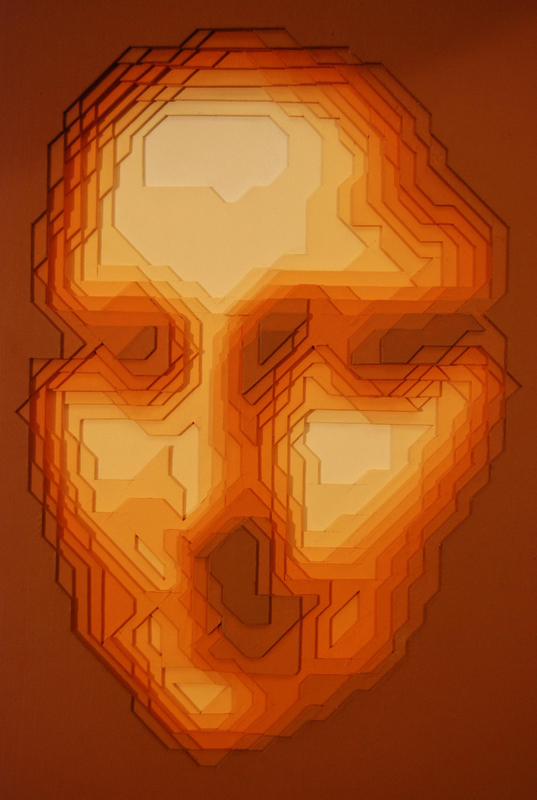 Yvaral made his first kinetic works-of-art in the late 1950’s and then began to use digital images in his work in 1975, creating geometric abstraction from faces, landscapes and monuments. From this he transitioned into his series of portraits of Mona Lisa, Marilyn Monroe, Salvador Dali, George Washington and Lincoln. 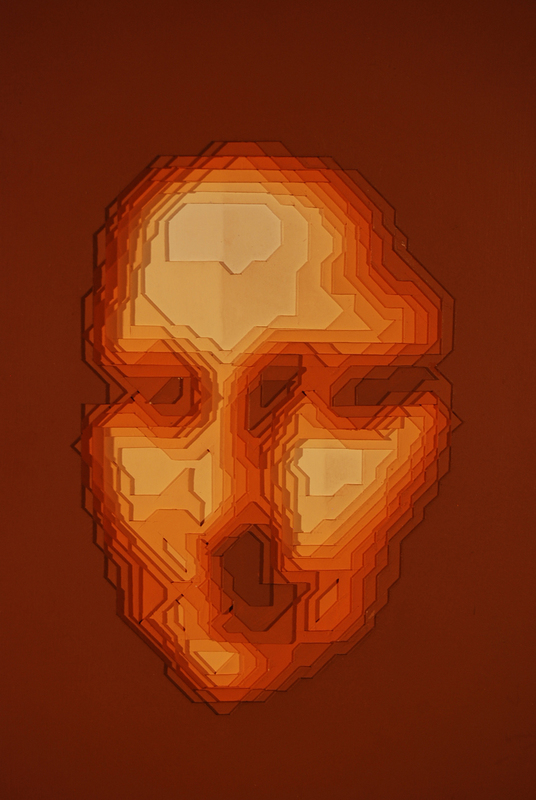 He spent long hours creating computer generated images from which he painted his finished artwork. Jean-Pierre Vasarely died in Paris in 2002 just five years after his famous father. Yvaral also left behind a large collection of artwork at his passing. 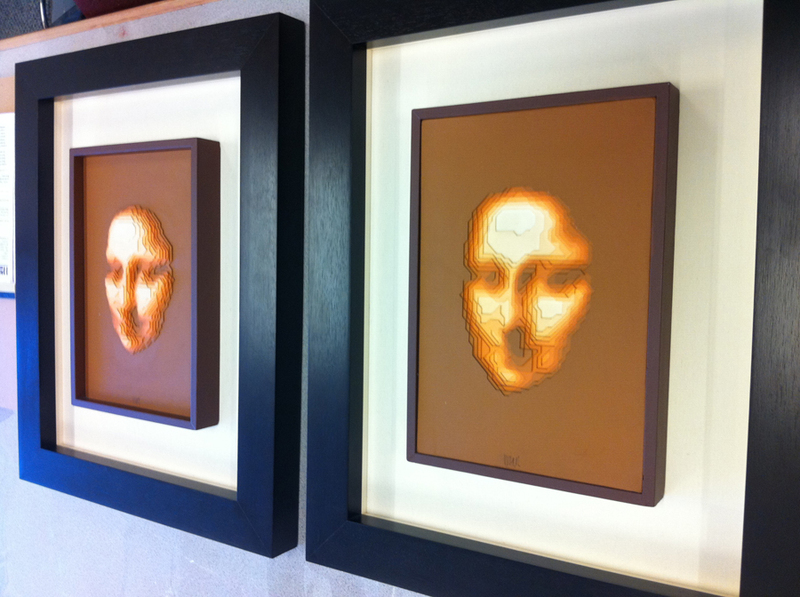 Mona Lisa Synthetisee ML301A & ML301B were created in 1986. They are the positive and negative of each other made of multiple layers of painted matt board. 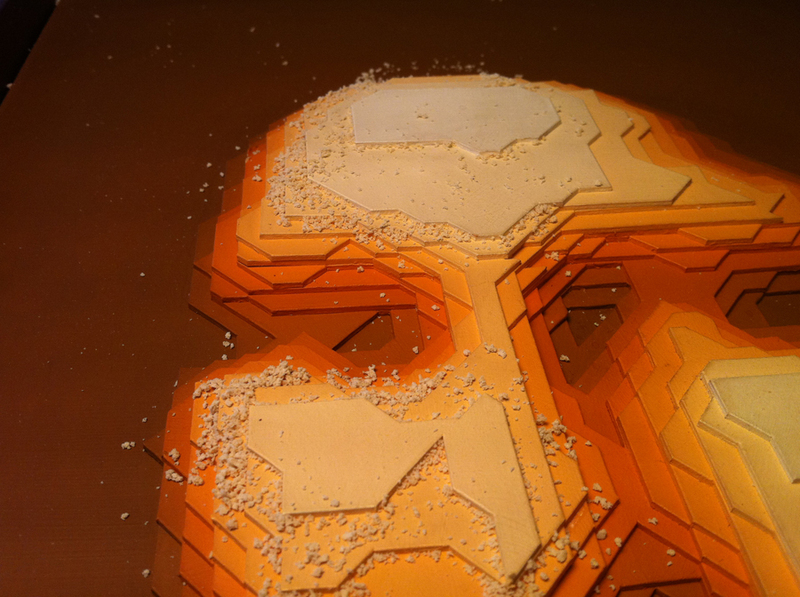 Each layer was cut out to form a portion of both paintings. The remnants of a layer from the first painting (negative image) was used to create the positive form of the same image in the second painting. These reverse complimentary images are visually electric and at the same time quite haunting. 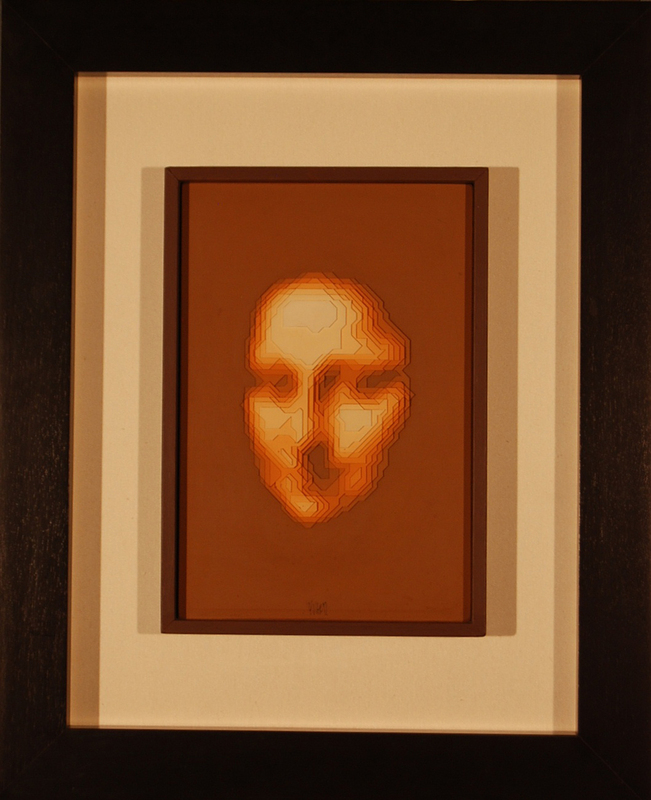 Yvaral created a number of very different Kinetic or Op Art paintings and prints using Mona Lisa as an immediately recognizable image. 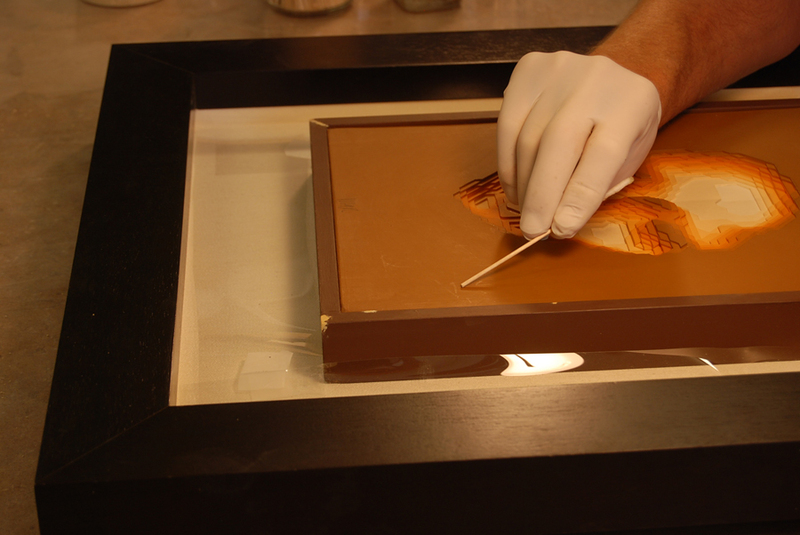 Each of the Mona Lisa Synthetisee paintings measure 15”h 10 ½”w and were both mounted in painted shadow boxes. It was not certain whether this framing was done by the artist. The frames however, visually enhance the images. Neither of the paintings had a surface varnish coating, and both were quite matt. 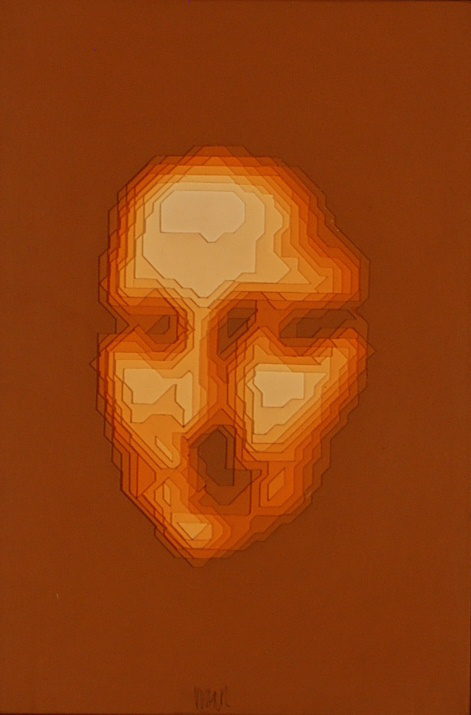 The paintings were made up of 15 distinct layers of 4-ply matt board, each layer being painted a different earth-tone color, from brown as the background to white as the facial highlights. The matt board is mounted on a piece of particle board. They each had a heavy dirt layer embedded into their acrylic paint surfaces with minor surface abrasions in the paint and several tips of the matt board being dented. 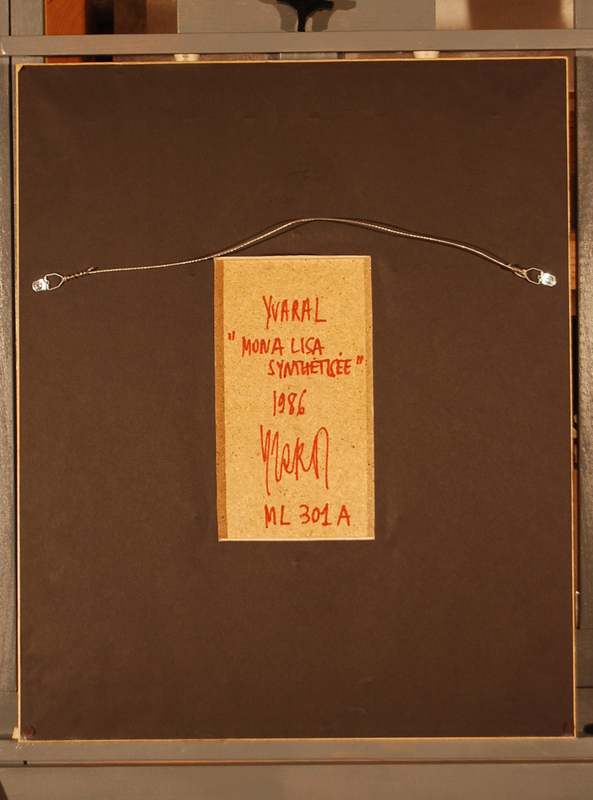 Both pieces are signed on the back by the artist in red marker – “Yvaral – Mona Lisa Synthetisee, 1986 ML 301 A,” and “ML301B,” respectively. Each painting was documented with a written report and digital photography, before, during and after treatment. The surface of each piece was first cleaned with crumbled eraser to remove the bulk of the surface grime and dirt. They were then further cleaned using Magic Erasers with added deionized water. This made a remarkable shift in color when the gray of the embedded dirt layer was removed. Dents in the tips of the matt board layers were gently swelled back into place using brushed on deionized water and a heated tacking iron. Minor surface accretions were removed with a surgical scalpel. Losses of paint and surface abrasions were minimally inpainted with conservation grade paints. Vice-Presidents Ceremonial Meeting Room – EEOB – Washington, D.C.
subscribing to our latest news and info on projects. © Copyright 2019. All rights reserved. Web Design by Webpagefx .